It's 1984. You know what would be great? Connecting Star Frontiers to a popular science fiction franchise. This would bring attention to the game and drive its future success. Let's see...FASA has the rights to Star Trek and The Last Starfighter. The third film in the Star Wars trilogy was released in '83, so public interest will probably wane... Perhaps it would be best to get in on the ground floor of an upcoming film and ride its coat tails. How about Dune ? It's set to be a merchandising bonanza. Also, Herbert's series is specifically listed as suggested reading on the inside back cover of the Star Frontiers rules. But wait... MGM is releasing a sequel to 2001. Never mind that it's not really space opera. Never mind that many of the game's target demographic had yet to be born when the original film was released. Kubrick's cinematic masterpiece is timeless; surely it can be easily adapted into an engaging role playing experience. Such may as well have been the thought processes of one or more persons at TSR. Regardless, we have been gifted with 2001 A Space Odyssey – “A Special Star Frontiers® Adventure Module.” The task of writing this special module fell to Frank Mentzer. At critical points in Mankind's history, an alien device, a monolith, appears and provides a key to the future. Through this adventure, the player characters are present each time a monolith appears. In each case, whether or not Mankind successfully enters the future offered by the monolith depends on how the player characters react and how much they learn about themselves and their universe. Obviously, the standard game setting is not used. 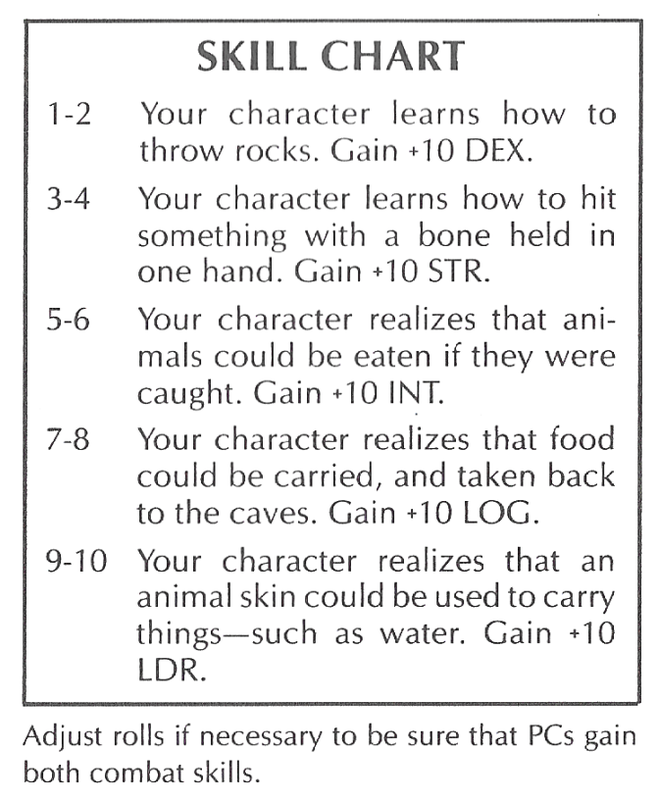 “If you put this adventure in your STAR FRONTIERS® game, place it back in time before humans contact the other races.” However, the adventure can be modified for the other intelligent races of Star Frontiers. For example, in a dralasite version of chapter one, the monolith might teach cooperation to primitive, independent dralasites. In a Yazirian version, the monolith might instigate the custom of life-enemies. The player characters are recruited by American authorities to locate a presumed extraterrestrial artifact on the moon. There are nineteen magnetic anomalies on the Lunar map, one of which is randomly determined to be caused by the artifact. 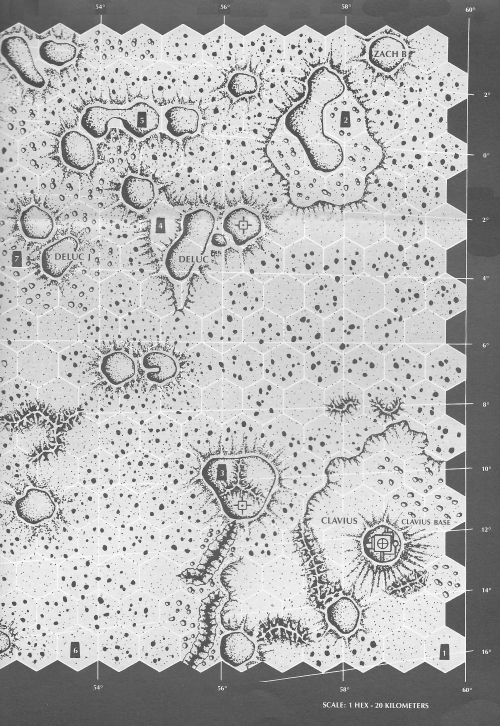 (Although the module refers to squares on the Lunar map, the map itself displays hexes.) Time is of the essence since the Chinese will arrive in sixty hours to perform their own explorations. One player character is secretly approached by a Russian agent and another by a Chinese agent. Respectively, the agents offer 50 credits “to openly claim [the anomaly] in the name of his country, instead of the U.S.A.” Whether or not the characters accept this generous offer, several NPCs will be working for the Russians or Chinese. 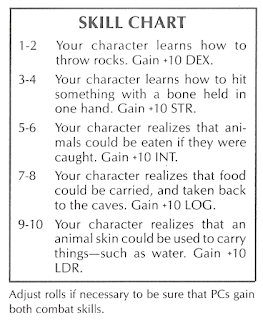 Player characters – either individually or in teams – explore the various anomalies using provided equipment. “After the large anomaly is pinpointed, all characters involved in the search are detained,” we learn, “The characters never learn the reason for the secrecy...” Outside the presence of the player characters, “a group of experts and technicians excavate around [the monolith].” Then the monolith “emits a series of five electronic shrieks.” One wonders what the players could learn about themselves and their universe via this chapter. Two new skills are described: Astronomy (“a new STAR FRONTIERS® technological skill”) and System Navigation (“a new spaceship skill for use with this module only”). According to Knight Hawks, the Piloting skill can only be acquired by characters with six levels of Technician and two levels of Computer. Yet this requirement is overlooked in 2001, William Hunter has Piloting 1 but only Technician 3. 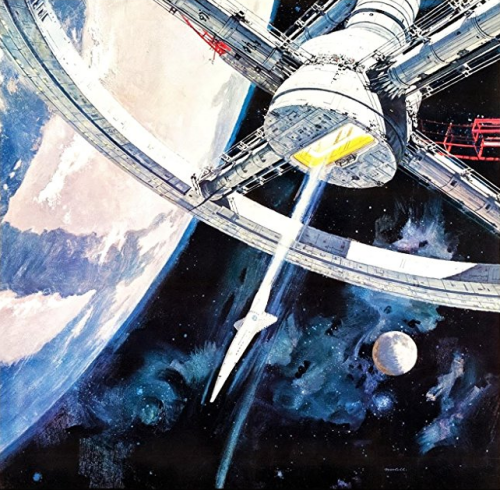 As in the film, the HAL 9000 computer works to eliminate the crew and we are advised, “Play HAL very cleverly.” The module supplies examples of what HAL can do against the characters. Before HAL attacks, player characters can use a Psycho-Pathology subskill to have HAL “remain calm for another 1 – 6 hours.” Ultimately, the player characters will have to disconnect HAL. Afterwards, player characters will need to handle the shipboard tasks manually. To this end, ship operations and equipment repair are described in thrilling detail. There are five paragraphs explaining how doors work. Eventually, the characters watch a briefing tape relating that a monolith was found in the crater Tycho (or “Substitute the name of the crater in which the monolith was found in your game”) thirteen months previously (even though chapter two took place in 1994 and the Discovery was launched on May 14, 2002). At the conclusion of chapter three, the player characters encounter a giant monolith. They have the choice of investigating the monolith (and proceeding to chapter four) or staying with the ship (and ending the adventure). You are above a world of incredible size – much larger than Earth. But there must be no atmosphere; all the surface details are clear, to the remote and flat horizon. 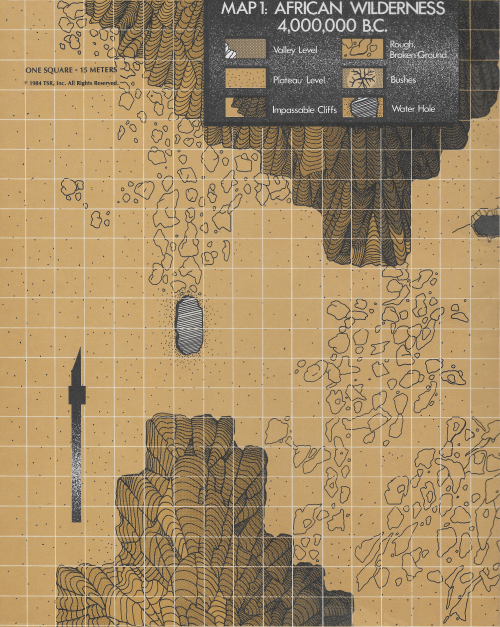 The surface is marked in huge patterns, probably miles across, of squares, triangles, polygons...and in them, here and there, gaping black shafts, much like the chasm from which you just emerged. The sky is disturbing. There are no stars, nor even the blackness of space, but only a milky whiteness. But no; there are tiny black dots, here and there, scattered across the sky. They seem oddly familiar – and then you realize that it looks like a photographic negative of the Milky Way. The character may return to the Dawn of Man, and help to teach the man-apes the basics of survival. The character may return to Earth's Moon, in the year 2015, to be rescued. The character may immediately return to the Discovery, to await rescue, but with no memory of the passage of the Star Gate. The character may become a higher form of life, an energy being, with no use or concern for material form. The character may go to an alien planet where another race faces a critical juncture, much live the Dawn of Man the crossroads of knowledge or extinction and help that race along the path to survival. And now it comes, and it is time to go; to take the final step on this greatest of all journeys; onward, to complete your Space Odyssey. If you choose to lose your memory, can it really be a journey? I remember that module. That whole adventure was problematic! After the Dawn of Man scenario, I was prepping the players to do the Jupiter Mission and the game fell apart with what was going to be expected of them, and I totally agree. We end-up going back to Dawn of Man to run a Rise of the Man-Ape Empire scenario where the Man-Ape characters became a mix of Conan-esque "barbarian horde" and rowdy frat-boys. It was a lot of fun. Well at least they didn't make a series of adventures in the Buck Rogers universe.